Canadian journalist Koppel chronicles recent efforts by archaeologists to prove that the first people came to America by boat, not on foot. American anthropology was dominated for most of the 20th century by the theory that big-game hunters from Asia crossed an Alaskan land bridge during the last Ice Age, roughly 12,000 years ago, moving south through an ice-free corridor east of the Rockies. Their artifacts, found from Kansas to New Mexico, made up the Clovis and Folsom cultures. Alternative theories faced skepticism due to the paucity of artifacts or human remains to support them. But beginning in the 1960s, some archaeologists proposed a coastal route, arguing that the melting glaciers had covered earlier settlements with hundreds of feet of ocean water. Koppel documents their efforts to substantiate these theories. He treats the reader to eyewitness descriptions of scientists crawling through nearly inaccessible caves high in the hills of Alaska and British Columbia, dredging for artifacts in the seabed, camping out in bear country, and fighting a constant battle with the treacherous weather and currents of the North Pacific. The author also gives a broad survey of work done elsewhere in the Americas, focusing on discoveries that brought the “Clovis first” theory into question. Few of the scientists here are household names, but Koppel renders them as distinct individuals and conveys a clear picture of what their day-to-day work is like. When at last some key discoveries made it clear that coastal settlements are of at least equal antiquity with Clovis, readers are well briefed to understand why archaeologists then raised their glasses to toast the changing of a scientific paradigm. 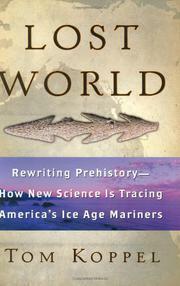 Despite the author's overt cheerleading for the coastal theory, a good overview of a fascinating slice of prehistory.